iCloud will store your music, photos, documents, contacts, calendar events and more and automatically push them to all your devices over Wi-Fi or 3G. Whenever you purchase music, apps and books in iTunes it will automatically transfer the items to your other iOS devices and your computer. Which means you can buy a song from iTunes on your iPad, and it will show up on your iPhone without having to sync it. You can buy a book on your iPhone and leave a bookmark, then pick up reading the book where you left off on your iPad. 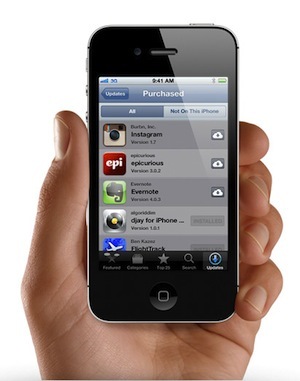 All of your previous purchases are available for download on your devices with iCloud. If you have music that was not purchased through iTunes, Apple has iTunes Match for $24.99 a year. iTunes Match will let you store your entire music collection in iCloud without having to upload most of your music. The only songs that would require uploading are ones that are not in the iTunes store. Photo Stream applies the same principal to your photos, if you take a picture on your iPhone it shows up on your iPad, iPod touch, computer or Apple TV. iCloud stores 1000 of your latest photos for 30 days. Photo stream works on both a Mac and PC. Mac users will need to upgrade to the latest version of iPhoto. Windows users need to install the iCloud Control Panel. With iCloud you get a free me.com email account. iCloud will automatically push new email messages to all your devices from this email account. The me.com email account will also allow you to create folders that will show up on your iPad, iPhone, iPod touch and computer. To set up an iCloud email account on your iOS device; go to Setting->Mail, Contacts, Calendars-> iCloud and follow the instructions. Your calendar and contacts work with iCloud as well. Add a contact or calendar event and it shows up on your other devices without having to sync. iCloud stores the web pages you�ve bookmarked, notes you�ve written, and reminders you�ve created. A note, reminder or bookmarked web page saved from one device will be there on your other devices with iCloud. All three of Apple�s iWork apps support iCloud. Pages, Keynote and Numbers documents are saved to iCloud and will appear automatically on other iOS devices. They can also be accessed on a computer by visiting iCloud.com. You can drag and drop any iWork 09 or Microsoft Office document from your computer into one of the iWork apps on icloud.com, and it automatically appears on all your iOS devices. With the Find My Friends app you can share your location with friends and family members. You will need to send a request and have that person accept the request before locations are shared. Locations can be shared temporally and you can disable your friends from seeing your location with the flip of a switch. Parents can setup a password to restrict kids from disabling their location. Find My iPhone, iPad, iPod touch and Mac are also a part of iCloud. You can view the location of your devices by visiting iCloud.com or from another iDevice. Which could be extremely valuable locating a lost device. iCloud automatically backs up your iOS device when it�s connected to a power source. iCloud backs up your camera roll, devices settings, app data, home screen, and app organization, messages (iMessages, SMS and MMS) and ringtones. You can restore from a previous iCloud backup during the setup process after restoring your device in iTunes or after Erasing All Content an Settings from the iDevice. To get started you need to have an iPad, iPhone or iPod touch with iOS 5 and have iCloud turned on. If you did not turn on iCloud after installing iOS 5, you can go to Settings-> iCloud and turn on iCloud for the things you want iCloud to push to your other devices. After you turn on iCloud on your iOS device, you are ready to set up iCloud on your computer. Mac users will need to upgrade to OS X Lion 10.7.2. 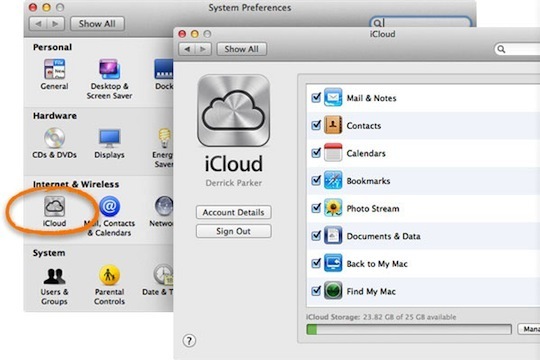 After the software is updated on your Mac there will be a iCloud icon in System Preferences under Internet & Wireless. There you can select the items you wish to use with iCloud. Windows users will need to download software and install the iCloud Control Panel. We have instruction for Windows users here.